Arsenal have arguably needed a holding midfielder since Alex Song left the Gunners for Barcelona in 2012. The calls for Arsene Wenger to sign a natural holding midfielder; the perfect foil for the centre of the park to bring balance to a rickety side, have been deafening over the past two years. The list of anchors the club have missed out on in successive transfer windows goes on and on; as it grew and grew, so did the fans' anxiety levels over the gaping hole in the heart of their team's midfield. Now they appear to have found their man. Given his performances in the second half of the season, it is difficult to imagine the Gunners beginning 2015/16 without Frenchman Francis Coquelin in their starting XI. 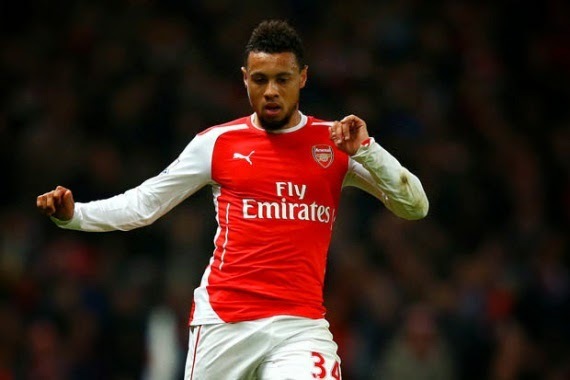 Coquelin began December 2014 on loan at Charlton Athletic; on the sixth day of the month, he played away to Nottingham Forest in a 1-1 draw at the City Ground. Fast-forward just over two months and he's anchoring the midfield against Monaco in the UEFA Champions League latter stages. That's quite the rise in power for the 23-year-old Frenchman and, on paper, a very underwhelming "solution" to the glaring issue at the forefront of Arsenal's issues. But Coquelin's been a revelation, locking the likes of club captain Mikel Arteta and Mathieu Flamini out of the team. The circumstances in which Coquelin has emerged as the answer are perhaps a little fortuitous, but the point is, Arsenal look like they've found an answer in a long-time problem position. There's a certain amount of trepidation and doubt surrounding a holding midfielder in this position. His introduction to the XI coincided with Wenger's switch from 4-2-3-1 to 4-3-3, placing a natural anchor in front of the defence and converting to a more reactive style of play. Coquelin possesses remarkable defensive instinct and a wonderfully proactive stance when his team are on the ball. He spent the first half against Leicester City closing off channels for Esteban Cambiasso to use when passing to Andrej Kramaric, and he's always an easy option in possession if Santi Cazorla and Co. are struggling to find an outlet. He crunches into tackles, but fairly—not like Flamini. He doesn't gesticulate wildly with his arms for no reason, but he instead fills gaps quietly and efficiently, bringing balance to the side. However, we're yet to see anything offensively impressive from the Frenchman, and that could be the main drawback as he seeks permanent employment in Arsenal's midfield. His passing is tidy and basic and he's safe in possession, but when compared to the elite holding midfielders, he falls understandably short. Given Coquelin's rapid rise from obscurity, we must allow time for these other facets to develop, or be willing to wait to see if they begin to show. But until such a time, Coquelin will be viewed tentatively, as a system player—despite the true verdict being that he is somewhere in between. Coquelin plays every game with abundant aggression. His impact has transformed the dynamic of the team. He’s most crucial characteristic is selflessness. He understands that he’s not the most technically gifted player in the team and is willing to sacrifice any attacking ambitions to offer perennial protection for the back four. The team has been rewarded with an excellent run of form, and Coquelin has been rewarded with a new long-term contract. Wenger will be delighted to have tied the younger Frenchman down for the foreseeable future. Replacing him would not be easy. Arsenal needs to sign someone who can provide cover and competition for Coquelin in the long term, but it’s unlikely they’ll find someone who is a better fit for the team. Having come through Arsenal’s academy, Coquelin is embedded in the style and culture of the club. Finding the one player who can bring balance to the team is a difficult task. In the space of a few months, he has become a key factor to this team. It took Arsenal years to discover a player who could bring bite to their midfield. Having finally stumbled upon someone able to give this team the structural security it needs, Wenger will cling to Coquelin.